Watching media coverage, you'd think Trump is nearly alone in believing "both sides" share fault for the Charlottesville violence. Turns out, most Republicans have his back. SurveyMonkey findings, previewed first for Axios readers, for an online poll yesterday with 2,181 respondents. Why it matters: These findings reflect the fact that, because of the nation's partisan divide and fractured media, we no longer agree on basic facts. That makes civil debate impossible. When presented with a verbatim quote from President Trump on Tuesday ("You had a group on one side that was bad, and you had a group on the other side that was also very violent"), more disagree (53%) than agree (43%). Republicans agreed, 87%-11%. Democrats disagreed, 83%-15%. Independents disagreed, 59%-39%. 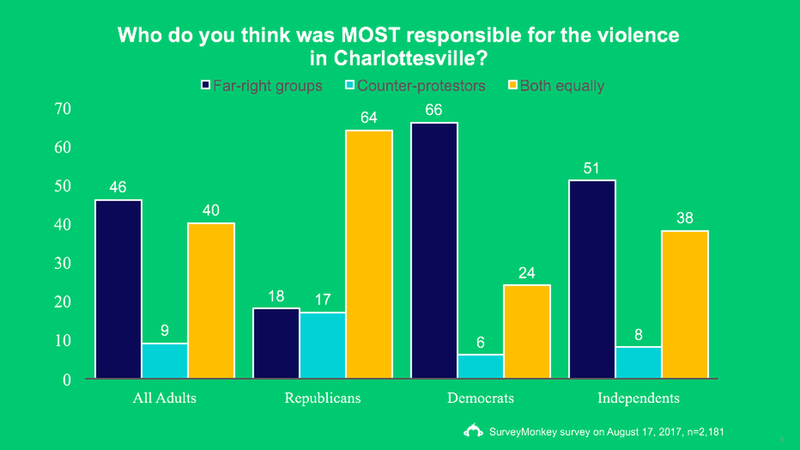 Far more blame "the far right groups" for Charlottesville (46%) than "the counter-protesters" (9%), but a remarkable 40% concur with Trump's assertion that both were equally responsible. "Beneath the surface, we see the same partisan division: Two-thirds of Democrats (66%) blame the far-right groups rather than the counter-protesters (6%), while Republicans overwhelmingly blame both sides equally (64%). About the same proportion of Republicans blame the far-right groups (18%) as the counter-protestors (17%)."